Who doesn't like getting flowers? 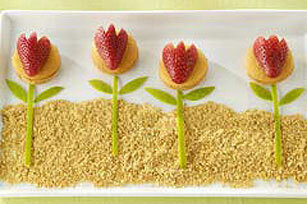 Especially when the blooms are made with vanilla wafer cookies, peanut butter and fresh strawberries! Spread 4 wafers with peanut butter; top with remaining wafers. Place on dessert plate. Cut tulip shape from each strawberry half. Place on wafers. Cut 4 stems from apple peels; cut leaves from remaining peels. Place stem at bottom of each tulip. Add leaves. Sprinkle graham crumbs around bottoms of stems to resemble dirt. Substitute PHILADELPHIA Strawberry Cream Cheese Spread for the peanut butter.